Santa Cruz Art: Call for participation for UnScruz, the official Santa Cruz decompression street party! Call for participation for UnScruz, the official Santa Cruz decompression street party! Santa Cruz's official Burning Man Decompression, UnScruz, is on Saturday, October 2, from noon to 10:00 p.m.
dancers, hula hoopers, LED/glow poi/staff, short silly plays, who knows!) for UnScruz. We are also looking for THEME CAMPS! us know by writing santacruz@burningman.com. THANKS! art, performance, theme camps, DJs, and MORE!!! only $10.00 in Playa couture/costume; $15.00 in streetwear. 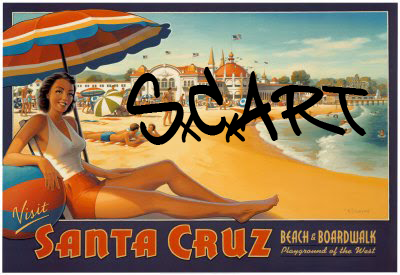 to the streets of Santa Cruz! PARTICIPATE, please let us know! Stay tuned for a list of theme camps, DJs, etc. who will be participating!